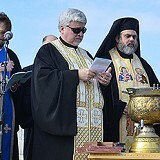 On Saturday, January 9th, faithful from Christ the Savior Mission joined St. George Greek Orthodox Church in Ocean City, MD, for the annual blessing of the Atlantic Ocean. Many thanks to Fr. Vasileos and the community of St. George for hosting this wonderful event to the glory of God! On Sunday, January 10th, Protopresbyter Daniel blessed the rectory in the Parish Center. Following the service for the annual blessing of a home, there was an open house in the rectory. Appreciation is expressed to Fr. Daniel as well as all who attended, prayed, prepared food, and shared in fellowship. On Sunday, January 10th, we kept the custom of the Vasilopeta (St. Basil's Bread). This year the coins were received by David McAlpin, Christiana Milite, and Cheryl Kokkinos. May the Lord grant them many blessed years! On Sunday, February 7th, the parishioners of Christ the Savior gathered together for their Annual Meeting. In addition to reviewing the minutes from last year's meeting, the parish body heard reports from the rector, senior warden, junior warden, treasurer, auditors, lay-delegate to the OCA's All-American Council and the parish council on stewardship. On Sunday, February 7th, new liturgical torches, to be used by the deacons and altar servers, were blessed before the Divine Liturgy. 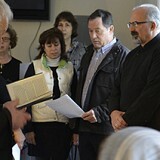 A new Gospel stand, fashioned by community members, was also blessed for the proclamation of the Good News. Appreciation is expressed to the donors and artificers. May the Lord bless! On Sunday, February 14th, the two remains sets of gold and purple altar server vestments were blessed. These vestments were made by an Orthodox monastery in the Republic of Georgia. Appreciation is expressed to those who donated and prepared them. May the Lord bless! On Sunday, February 28th, the Rite of Crowning was performed for Daniel and Kathleen Moss. We heartily congratulate them on this special day, asking the Lord's continued blessings upon them as they grown in their union with Him and each other! On Sunday, March 20th, with the blessing of our diocesan hierarch, Metropolitan Tikhon, the 2016 Parish Council members were installed into office. During the first meeting of the 2016 Council, Deborah Wilson was elected Senior Warden and Barbara Kaloroumakis was elected Treasurer. May the Lord bless them all! On Friday, March 25th, following the divine services for the Annunciation and a festive luncheon, a Pysanky Class was offered for parishioners and friends of Christ the Savior. A good time was had by all and we thank those who helped make this event happened, especially Cecilia Wynat who led the class. Glory to God for a joyous celebration of the feast and an enjoyable day of fellowship! 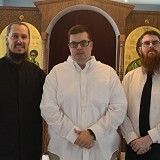 On Saturday, April 23rd, the Feast of the Raising of Lazarus, Chad Michael Fortin received the Sacrament of Baptism, becoming a member of the Holy Orthodox Church. We rejoice, together with Chad Michael and his sponsor, Andrew Hageman, on Chad's reception into the Body of Christ, and we ask the Lord to continue His divine blessings upon him, granting him health, strength, salvation, a furtherance in all good things, and many blessed years! 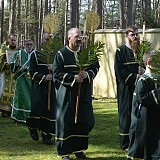 On Palm Sunday, April 24th, the faithful gathered to celebrate the Lord's Entrance into Jerusalem. This joyous feastday included the beautiful divine services, a liturgical procession, and a tasty fish meal. We thank the Lord and all who made this day so festive! As we now enter into the Great and Holy Week, we ask the Lord's blessing to help us pass these all-revered days in godliness, commemorating the savings acts of His voluntary Passion, being incorporated into the mystery of His salvation, and looking to the bright and radiant celebration of Holy Pascha. On Great and Holy Wednesday, April 27th, the faithful gathered for the Mystery of Holy Unction, the anointing with holy oil for the healing of soul and body. The Church’s practice of Holy Unction dates back to Apostolic times, see James 5:14. 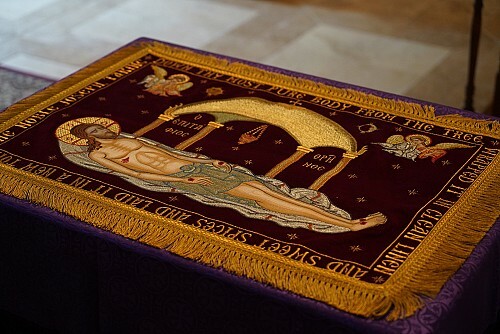 From April 24 - April 30, the faithful gathered at Christ the Savior to celebrated the solemn liturgical services of Great and Holy Week, which commemorates the Lord's voluntary Passion, His Cross, Death and Burial. On Sunday, May 1st, the faithful gathered for the Midnight service, celebrating the Feast of Feast, Holy Pascha, which commemorates the Resurrection of our Lord God and Savior Jesus Christ. Over 100 people gathered for the celebration of the liturgical services which were followed by the blessing of foods and a festive meal in the hall and rectory. We greet you all with the joyous exclamation, "Christ is risen! Indeed He is risen!" 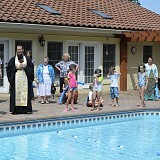 On Thomas Sunday, May 8th, an egg hunt was held for the children of the parish. As we know, the egg is widely used as a symbol of the start of new life, just as new life emerges from an egg when the chick hatches out. However, there were of course no chicks in these eggs, just chocolate and candy - much to the delight of the children and the dread of their parents! On Sunday, June 12th, the following prayer was offered for the annual blessing of the pool: O Lord, how marvelous are Thy works. In wisdom hast Thou made them all. Send down Thy heavenly blessing upon this pool. Protect all who swim in it. Keep them safe as they enjoy the recreation and fellowship which it provides. For Thou art the Provider of every good gift, Who dost fill our hearts with joy and gladness, always, now and ever, and unto the ages of ages. Amen. On Sunday, June 19th, the faithful gathered to celebrate the feast of Pentecost which commemorates the descent of the Holy Spirit upon the Apostles fifty days after the Lord rose from the dead. As is customary, the Vespers for the Day of the Holy Spirit together with the Kneeling Prayers were served immediately following the Divine Liturgy. We also offered prayers for our teachers and students at the end of the academic year. On Sunday, July 17th, at the end of the Divine Liturgy, we had the annual Blessing of Chariots. It is a custom of Orthodox Christians to have their cars blessed both when newly acquired and on or near the feast of the Prophet Elias (July 20th), as he ascended as if into heaven on a fiery chariot. On this day we were joined by numerous visitors include Archpriest Daniel Kovalak and Archpriest Thomas Soroka, who offered an inspiration sermon. We thank God for a truly blessed day! 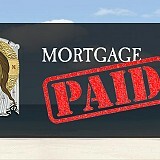 An anonymous donor has paid off the remaining $318,000 on the church's mortgage! We ask that Lord Almighty to bless this supremely generous donor together with their entire family and loved ones, granting them all health, strength, salvation and a furtherance in every good thing! On Sunday, July 24th, we had the baptism of Theodosia Caroline, daughter of Dana and Cecilia Wyant. We congratulate them as well as, George and Anya, the sponsors, the entire family and friends. May the Lord God grant Theodosia and them all heath, strength, salvation, furtherance in every good thing and many bless years! On Sunday, August 7th, the parish celebrated the 10th anniversary of Fr. John's assignment to the mission. Deborah Wilson, senior warden, offered congratulatory remarks on behalf of the parish and presented a card and gifts to Fr. John and Matushka Emily. Following a parish photo, a festive luncheon was held in the parish hall. Thanks be to God and the good people of Christ the Savior for such a wonderful day! On Monday, August 15th, the faithful gathered to celebrate the Dormition of the Virgin Mary, which is the annual festal commemoration the death, burial, resurrection and ascension of the daughter of Adam who became the Mother of God, whom as the Scriptures say, shall be called blessed by all generations. We were pleased to welcome a number of visitors including Protodeacon Gregory Moser, who coserved with Fr. John. 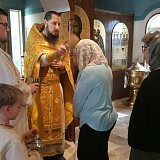 On the weekend of August 20-21, 2016, His Beatitude, Metropolitan Tikhon was welcomed by Priest John Parsells and the faithful of Christ the Savior Mission, Berlin, MD. The visit coincided with the burning of the mission’s mortgage—the $318,000.00 balance had been paid in full by an anonymous parishioner, fifteen years before it was due. On Sunday, August 28th, at the beginning of the Academic Year, we asked the Lord's blessing upon the teachers and students. May the Lord enlighten and guide them into His divine truth! On Sunday, September 18th, we had the baptism of Eliana Maria, daughter of Jerry and Camelia Milite. We extend our congratulations to the entire family as well as the sponsors, Maksim and Ramona. May the Lord grant them all health, strength, salvation, a furtherance in every good thing, and many blessed years! 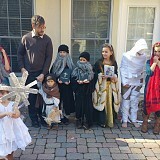 On Sunday, November 6th, the children participated in our annual St. Michael's party, by dressing as saints and angels. Other activities including a pinata, a photo booth, donut tree, and various crafts. The St. Michael's Party also coincided with the parish Thanskgiving meal with the traditional foods and fixings. Many thanks to all who made this year's St. Michael's party and Thanksgiiving meal such a great success! On Sunday, November 6th, we asked the Lord's blessing upon those in the healing ministries. May the Lord strengthen them in their efforts to bring healing and consolation to those suffering in body and soul, and may He grant them all many blessed years! As the faithful gathered to celebrate the Nativity of the Lord, God and Savior Jesus Christ according to the flesh, we humbly asked the Lord's continued blessing upon you all for a joyous, peaceful and grace-filled festive season and New Year. Christ is born! Glorify Him!